Rotor cuffs, rotary cups, “my rotator” - you name it, I’ve pretty much heard all the misnomers for the group of muscles and tendons surrounding your shoulder joint called the Rotator Cuff. Most people have either heard of it or think they know something about it. 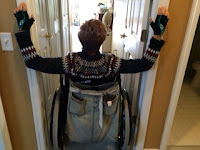 Since it’s a pretty crucial area for people of all ability levels, especially those who push themselves in wheelchairs, I thought it might be helpful to clear the air about the Rotator Cuff. 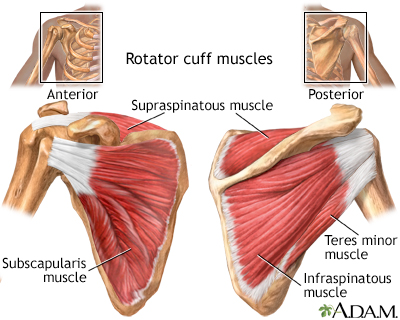 WHAT IT IS: The Rotator Cuff (also commonly designated RTC) is a group of 4 muscles and their respective tendons encapsulating the shoulder joint. 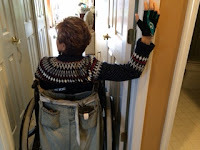 WHY IT’S IMPORTANT: We utilize the RTC all throughout our day when we use our arms for activities like propelling, styling our hair, getting dressed, putting a seatbelt on, or hooking an arm around the armrest to weight shift, etc. Since we utilize the RTC so frequently, it is prone to injuries such as tendonitis, bursitis and muscular tears. Making every effort to keeping this group of muscles strong and mobile is key to reducing or preventing risk for injury. External Rotation using a band: stand or sit with good posture, feet hip width apart. Hold the band in both hands, palms up. Bend your elbows so they touch either side of your waist. 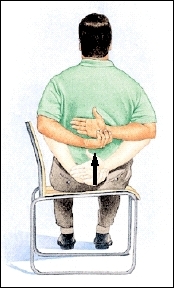 Keeping your elbows against your body, rotate your hands outward. Stop just before your elbows come away from your sides. Slowly return to start position. Perform 2 sets of 15 repetitions. Internal Rotation with a band: attach one end of the band to a door, spindle or piece of machinery. If using right hand, stand or sit alongside where the band is attached (not facing it) with right side closest to the band. Holding the band in the right hand, move out until there is some tension. 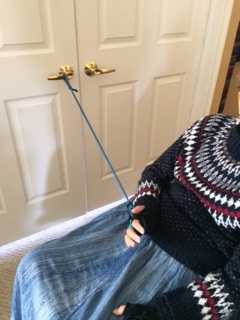 Keeping your elbow bent and in contact with your waist, pull your hand inward towards your body (as if to put your hand on your belly button). Slowly return to start position. Perform 2 sets of 15 repetitions PER SIDE. HOW TO KEEP IT MOBILE: Keeping muscles mobile is crucial to prevent injury and the RTC is no exception. Considering these muscles also play a role in our posture, having good posture will go a long way in keeping the RTC healthy as well! These stretches should provide a mildly uncomfortable “pulling” sensation but NOT pain. Doorframe stretch: For stretching across the chest and front part of the shoulder. 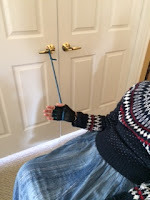 Find a doorframe and sitting just outside of it, place your lower arms and hands on either side. You may have to roll forward slightly and/or gently lean forward. Hold for 45-60 seconds, switch feet and repeat. Perform 4-6 repetitions. 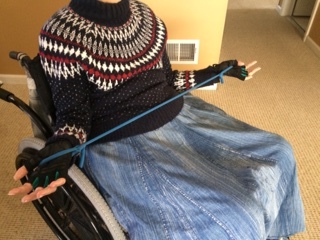 This can be done with both arms, looking straight ahead or for more stability, one arm at a time, looking over opposite shoulder. Towel Stretch: Use a beach or kitchen towel. 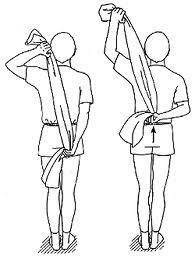 Holding the towel in your right hand, place your right hand overhead, allowing the towel to go behind you. 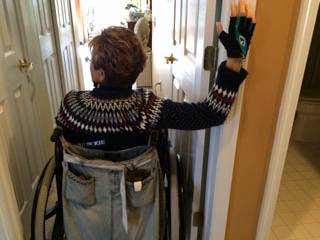 Turn your left hand inwards and reach behind you, trying to grab the towel somewhere around the small of your back. As you are able, gently lift your right hand towards the ceiling, allowing the left arm to get the stretch. Be sure to use a towel that is long enough to grab. 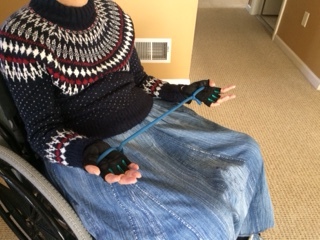 Hold for 45-60 seconds, then release with your left hand. Repeat 4-6 times PER SIDE. These are just a few basic ways to strengthen and stretch the RTC to keep it healthy. For those who rely on their arms to also do the work of their legs, this is not a muscle group to be ignored! About the Author: Kate Helfrich, PTA, Certified Exercise Physiologist, ACSM is the founder of Merge Fitness which provides in-home one-on-one personal training sessions to individuals of all ability levels in the Bucks and Montgomery county, PA areas. For more information, email mergefitnessllc@gmail.com.